The territories listed below are those that were fully annexed into Germany proper. The Memel Territory (Memelland or Memelgebiet), north of the Neman River and including the city of Klaipėda (both called Memel in German), on 22 March 1939. The area was to be administered by the League of Nations according to the Treaty of Versailles, but had been unilaterally occupied by Lithuania in 1923. The Free City of Danzig (Freie Stadt Danzig), incorporated on 8 October 1939 into the newly formed Reichsgau of Danzig-West Prussia. A 20th-century counterpart of the Napoleonic free city created after the French emperor's crushing victory over Prussia in 1807, it was a semi-autonomous city-state in Danzig established by the Treaty of Versailles that existed during the interwar in the Polish Corridor. Under Polish influence guaranteed by the League of Nations despite being German-populated, its contentious status was exploited by the Nazis and culminated in the "Danzig crisis" and was the Second World War's immediate trigger. The Incorporated Eastern Territories (Eingegliederte Ostgebieten), by two decrees on 8 and 12 October 1939 after a short spell under military administration, a large part of western Poland under German occupation was integrated into the Reich, the result of a "fourth" partition of Poland between Nazi Germany and the USSR sealed by the secret protocols of the Molotov-Ribbentrop pact. 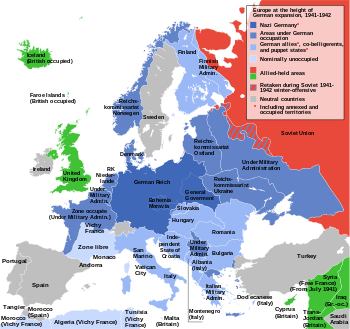 After Germany's invasion of their former partner in 1941, some parts of eastern Poland that had been annexed to the Soviet Union were in turn annexed by Germany. The Sudetenland, in October 1938 from the inter-war Czechoslovakia. The areas bordering Germany of Austria-Hungary that been dissolved by the post-First World War treaties and part of the newly created country were predominantly German-populated. Adolf Hitler's demands for their autonomy or reattachment to Germany triggered the Sudeten Crisis and the threat of imminent war in Europe. It was resolved by the Munich Agreement, which allowed their annexation (as well as other parts of the country by Hungary and Poland) in exchange by a guarantee from Hitler to respect the future territorial integrity of the remainder of Czechoslovakia. Austria (Österreich), in the Anschluss of March 1938. The Austrian state, a rump of the former Austria-Hungary, was annexed in its entirety and incorporated into Germany as Ostmark, violating the Treaty of Versailles and the Treaty of Trianon that forbade Austrian union with Germany. Northern Slovenia (Nordslowenien), in April 1941 following the invasion of Yugoslavia on the sixth of that month. Part of Cisleithania before the First World War. Alsace-Lorraine (Elsaß-Lothringen), annexed from France by the German Empire as part of its creation following the Franco-Prussian War in the 1871 Treaty of Versailles that concluded that war, returned to France in 1918 following the First World War, and re-annexed on 22 June 1940, as one of the terms of the Second Armistice at Compiègne that followed the German victories in the preceding weeks. Moselle and Alsace later became respectively part of Gau Westmark and Reichsgau Oberrhein ("Upper Rhine"). Luxembourg (Luxemburg) in August 1942. The grand-duchy owed its independence to the facts it had been in a personal union until 1867 (when the Treaty of London was signed) with the crown of the Netherlands and part of the German Confederation and Holy Roman Empire. It was fused with the Gau of Koblenz-Trier to form the Gau of Moselland. Eupen-Malmédy (Eupen-Malmedy) in June 1940, when the predominantly German-speaking in Belgium's border area was integrated with Köln-Aachen Gau. Historically a part of the Low Countries, they had been awarded to Rhenish Prussia by the Congress of Vienna in 1815 and to Belgium by the Treaty of Versailles in 1920. Belgium (Belgien) and northern France (Nordfrankreich), de jure only from December 1944, as the area had already been liberated in September 1944. It had been under military occupation between 1940 and 1944 as the Military Administration in Belgium and Northern France, administratively combining most of Belgium with the two French departments of Nord and Pas-de-Calais. In July 1944 it had been ephemerally replaced by a civil administration, the Reichskommissariat Belgien-Nordfrankreich. The theoretically annexed area was divided into three Reichsgaue, of Flanders (Reichsgau Flandern), Wallonia (Reichsgau Wallonien), and the district of Brussels (Distrikt Brüssel). A part of Wallonia was under German control in December 1944/January 1945 during the Battle of the Bulge. A hypothetical extent of the Greater Germanic Reich. 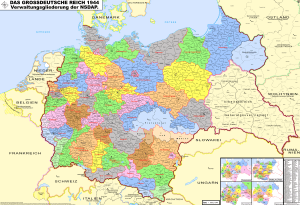 The territories listed below are those that were partially incorporated into the Greater German Reich. The General Government (Generalgouvernement) on 12 October 1939, following the annexation of the parts of Poland under German military occupation (corresponding roughly to the share annexed by Prussia during the course of the three partitions of Poland in the late 18th century), the remaining Polish territory passed under civil administration as a governorate called Generalgouvernement für die besetzten polnischen Gebiete ("General Government for the Occupied Polish Territories"). 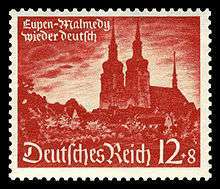 The name was officially shortened to just Generalgouvernement on 31 July 1940 by governor Hans Frank on Hitler's authority. In 1941 eastern Galicia, part of the Habsburg Austrian empire since the First Partition of Poland in 1772, was added to the governorate. The Protectorate of Bohemia and Moravia (Protektorat Böhmen und Mähren), proclaimed on 16 March 1939 when Hitler broke the promise he made at the Munich Conference to respect Czechoslovakia's further independence by sending the Wehrmacht to march into Prague. Although officially a protectorate (under a so-called Reich Protector "supervising" a nominally autonomous Czech government but in practice having all powers), it was a de facto annexation. Slovakia gained its independence as a German client state as part of the event, and the remainder of the former Czechoslovakia, i.e. Bohemia and Moravia minus the Sudetenland formed the protectorate. The Operational Zone of the Adriatic Littoral (Operationszone Adriatisches Küstenland, abbreviated "OZAK") was established on 10 September 1943, two days after its main Axis partner Italy signed the Armistice of Cassibile with the Allies. As a reaction the Germans implemented the Fall Achse ("Case Axis") operation, taking over northern Italy and Italian possessions in the Balkans and setting up the Italian Social Republic as a fascist client state on 23 September. It was constituted of the Slovene lands annexed by Italy from Yugoslavia in 1941 together with the regions of Friuli and Istria with Trieste that had been ceded to Italy by the imperial half of the Habsburg double-monarchy in 1920. Although not formally annexed, it was administered as a part of Reichsgau Kärnten. Operational Zone of the Alpine Foothills (Operationszone Alpenvorland, abbreviated "OZAV"), similarly set up to OZAK on 10 September 1943 from the provinces of Trentino and South Tyrol (Südtirol, with a predominantly German population) ceded to Italy in 1920 and the province of Belluno, and administered as a part of Reichsgau Tirol-Vorarlberg. 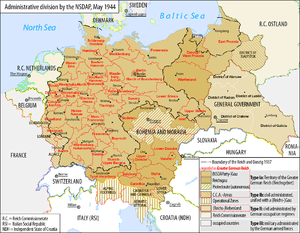 In the coming Nazi New Order, other lands were considered for annexation sooner or later, for instance North Schleswig, German-speaking Switzerland, and the zone of intended German settlement in north-eastern France, where a Gau or a Reichskommissariat centred on Burgundy was intended for creation, and that Heinrich Himmler had ambitions for it to be his SS's very own fiefdom. The goal was to unite all or as many as possible ethnic Germans and Germanic peoples, including non-Germanic speaking ones considered "Aryans", in a Greater Germanic Reich. The eastern Reichskommissariats in the vast stretches of Ukraine and Russia were also intended for future integration into that Reich, with plans for them stretching to the Volga or even beyond the Urals, where the potential westernmost reaches of Imperial Japanese influence would have existed, following an Axis victory in World War II. They were deemed of vital interest for the survival of the German nation, as it was a core tenet of national-socialist ideology that it needed "living space" (Lebensraum), creating a "pull towards the East" (Drang nach Osten) where that could be found and colonized. Whatever was once an Austrian possession we must get back into our own hands. The Italians by their infidelity and treachery have lost any claim to a national state of the modern type. The annexation of the entire North Italy was also suggested in the long run. ↑ Arnauld, Andreas von (2012). Völkerrecht. Heidelberg: C. F. Winter. p. 34. ISBN 978-3-8114-9761-0. ↑ Michael Wedekind (2005). "The Sword of Science". In Ingo Haar; Michael Fahlbusch. German scholars and ethnic cleansing, 1919-1945. Berghahn Books. pp. 111–123. ISBN 9781571814357. ↑ Petacco 2005, p. 50. ↑ Kersten 1947, p. 186.